Wakefield Trinity head coach Chris Chester believes that next year’s Super League will prove to be one of the most competitive. 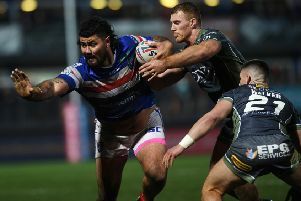 Wakefield are targeting a place in the Super League play-offs, following a change in format which gives the top five teams the chance to make it to Old Trafford. But Chester insists that things won’t get any easier for his side heading into the 2019 campaign. “I am genuinely excited about the competition next year,” said Chester. “It is probably the strongest Super League we have had in a long, long time. You can tell with the signings that are coming over from Australia. “Teams like Leeds have really strengthened, Warrington have strengthened even more so than last year. “And St Helens are going to be very, very difficult to beat and Hull KR are signing a few players. “This year is going to be a very tough Super League and we have got a tough start against London Broncos. “What you find is that when teams get promoted from the Championship into Super League, they raise the bar for the first three or four weeks. In previous seasons, teams were unable to plan for a full set of fixtures due to the Super 8s format. Previously, Super League would be split into a top eight and bottom four with a new set of fixtures released depending on where teams had finished. And Chester admits that Trinity’s ambitions remain high following three top-eight finishes in the last three seasons. “We know this year that it is a top-five Super League and we want to be involved in those big games and in those semi-finals,” he added. “We don’t want to be fighting down the bottom end. We look at blocks of games and can see where the wins are that we need to try and come up with.